The School of Criminology and Criminal Justice offers a number of scholarships for undergraduate and graduate Criminology and Criminal Justice majors. Applications for the SCCJ scholarships are due at the same time each year on February 1st. Below are the details of the SCCJ scholarships available to students attending classes on the University of Nebraska--Lincoln campus. If you have any questions regarding the SCCJ scholarships and awards, please contact Dr. Samantha Clinkinbeard at sclinkinbeard@unomaha.edu. To review scholarship criteria and apply for the following SCCJ Scholarships, please visit the UNO SCCJ website. The Jeff Marshall Scholarship Fund provides support for students admitted to the undergraduate Criminology and Criminal Justice Program and enrolled full-time at UNL. Up to $750 will be awarded each academic year. The Honors Committee of the School of Criminology and Criminal Justice and the Marshall family will review applications and make recommendations to the School Director. Eligibility Criteria: (1) Enrolled at UNL on a full-time basis, (2) A Criminology and Criminal Justice major of junior or senior standing, (3) Expressed desire to work in an area of public service, & (4) Demonstrated academic growth and future potential. Approximately $1,000 may be awarded to an outstanding Lincoln police officer who has reached senior standing (by the time of the award). The Knapp Scholarship Fund provides support for two scholarships to undergraduate students in the School of Criminology and Criminal Justice. The scholarships shall be in the amount of $2,000 each academic year. Eligibility Criteria: (1) Must be majoring in the Criminology and Criminal Justice program on the UNO or UNL campus, & (2) Financial need* shall be a criterion in making this award. The Board of the Criminal Justice Education Fund evaluates applications for a scholarship to be given to an undergraduate or graduate student in Criminology and Criminal Justice. Multiple awards up to $1,000 may be available. Eligibility Criteria: (1) Criminal Justice student in either UNL or UNO undergraduate or graduate program, & (2) Scholastic achievement. The Webb Family Scholarship Fund provides support to undergraduate students in the School of Criminology and Criminal Justice. Up to $1,000 will be awarded. Eligibility Criteria: (1) Must be majoring in Criminology and Criminal Justice on the UNL or UNL campus, & (2) must have senior standing by the time of award. 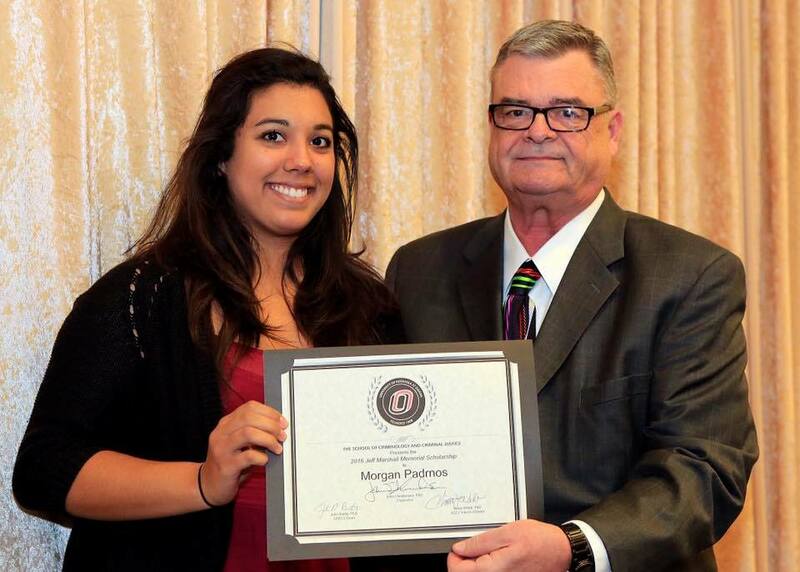 The Detective Kerrie Orozco First Responders Scholarship fund provides support to undergraduate students with a desire to pursue a career as a first responder (local, state, or federal law enforcement, fire, or EMT). Up to $1000 will be awarded. Eligibility Criteria: (1) Must be majoring in Criminology and Criminal Justice; (2) must be a resident of Nebraska or Iowa; (3) must be a junior or senior by time of award (i.e., Fall 2016); (4) should have a record of community service; (5) expressed desire to pursue a career as a first responder; (5) preference will be given to candidates with financial need and with a GPA of at least 2.5. The following Criminal Justice related scholarships may have different due dates for the applications and specific application requirements so please read carefully. Each year the William Wakefield London Study Abroad Award provides support for Criminology and Criminal Justice student enrolling in and completing the Comparative Criminal Justice Systems: England course at UNO or UNL at either the undergraduate or graduate levels. Up to $2,000 will be awarded each year to one or more students with no individual award to exceed $1,000. Eligibility Criteria: (1) Enrolled and accepted to participate in the Comparative Criminal Justice Systems: England course (2) Criminology and Criminal Justice major/pre-major at either UNO/UNL campus (3) Financial Need will be considered in making this award. Preference will be given to economically disadvantaged students who would not be able to participate without receiving the scholarship (4) Required participation in the London travel component of the course. Application materials will be provided at the time of acceptance to the program. The Len & Ann Freeman London Study Abroad Scholarship provides a scholarship for support for a Criminology and Criminal Justice student enrolled in and completing the Comparative Criminal Justice Systems: England course at either the undergraduate or graduate level. The amount of the scholarship is generally $3,000 and will be awarded each year. 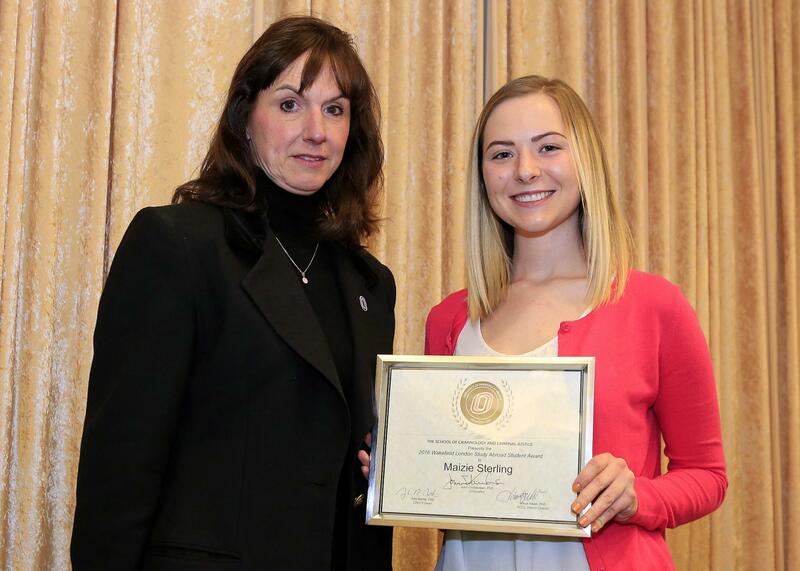 The National Criminal Justice Honor Society awards scholarships and Outstanding Paper Awards. Review all criteria and application information at http://www.alphaphisigma.org/scholarships-grants-1.html. The deadline for APS scholarships and awards is January 31.